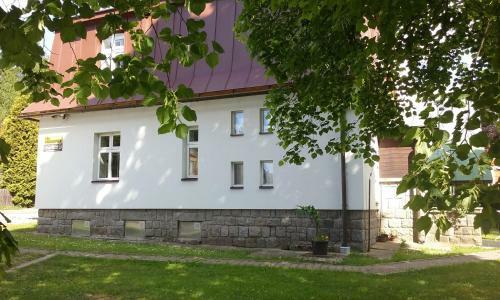 Prokopka in Harrachov offers accommodation with free WiFi, an 8-minute walk from Ski Jumps Harrachov, 700 metres from Ski lift Čertova Hora and 700 metres from Mumlava Waterfall. The apartment is in an area where guests can engage in activities such as skiing and hiking. The apartment includes 2 bedrooms, a kitchen with an oven and a microwave, as well as a kettle. Free private parking is available at the apartment. Prokopka offers a barbecue. Ski storage space is available on site. Bobsleight Harrachov is 1.5 km from the accommodation. The nearest airport is Pardubice Airport, 87 km from Prokopka.